The biggest hydroelectricity project in West Africa from the 1960s, for aluminum exports, created the Volta lake displacing 80,000 farmers to build a national idea of "development"
The Akosombo Dam, also known as the Akosombo Hydroelectric Project, is a hydroelectric dam on the Volta River in southeastern Ghana in the Akosombo gorge and part of the Volta River Authority. Originally designed in the 1920s to serve the British metropole, the Volta River Project was reshaped by the country’s founding leader Kwame Nkrumah in the 1950s. The revised project included a hydroelectric dam, an aluminum smelter to process Ghanaian mined bauxite, new cities, a deep sea harbor, and other infrastructural investments. The project became central to a modernization program that promised rapid industrialization and reducing the country’s dependence on cocoa exports. The development of the Volta River Basin was finally proposed in 1949; however, because there were insufficient funds, the American company Volta Aluminum Company (Valco) loaned money to Ghana so that the dam could be constructed. The primary purpose of the Akosombo Dam was in fact to provide electricity for the aluminium industry, which within Ghana was dependent upon the proposed hydroelectric power. The final proposal outlined the building of an aluminum smelter at Tema, a dam constructed at Akosombo to power the smelter, and a network of power lines installed through southern Ghana. The aluminum smelter was expected to eventually provide the revenue necessary for establishing local bauxite mining and refining, which would allow aluminum production without importing foreign alumina. The proposed project's aluminum smelter was overseen by the American company, Kaiser Aluminum, and is operated by Valco. The smelter received its financial investment from Valco shareholders, with the support of the Export-Import Bank of Washington, D.C. However, Valco did not invest without first requiring insurances from Ghana's government, such as company exemptions from taxes on trade and discounted purchases of electricity. According to Miescher, "The Volta scheme is an excellent prism to reconstruct how a large dam became not just the engine for the imagined transformation of Ghana during Africa’s era of decolonization but also a vehicle for multiple actors with competing agendas within the Cold War context.". In the postwar period, new players arrived on the scene of development. In addition to the imperial powers, the United States and the USSR, as well as Germany and the Scandinavian countries became sponsors of development. Others included international organizations, particularly the United Nations and the World Bank, and multinational corporations like the global aluminum industry. The dam was finally built between 1961 and 1965, after Nkrumah’s government came to power in 1951 and moved the Volta project to the center of its modernization agenda of his country. The Tennessee Valley Authority (TVA), the famed New Deal project launched by President Roosevelt in 1933, became a model of how the Volta scheme could transform the country. Its development was undertaken by the Ghanaian government and funded 25% by the International Bank for Reconstruction and Development of the World Bank, the United States, and the United Kingdom. In May 1960, the Ghana government called for tenders for construction of the hydroelectric dam. In 1961 an Italian consortium, Impregilo which had just completed the Kariba Dam, won the contract. They carried out the dredging of the river bed, dewatering of the channel and completed the dam a month earlier than scheduled despite flooding of the Volta River in 1963 which delayed work for over three months. Between 1961 and 1966, 28 workers of Impregilo died during the construction of the dam. The construction of the dam flooded part of the Volta River Basin, and led to the subsequent creation of Lake Volta. Lake Volta is one of the largest man-made lake in the world by surface area. It covers 8,502 square kilometres (3,283 sq mi) and has a volume of 148 cubic kilometers. It covers 3.6% of Ghana's land area. The flooding that created the Lake Volta reservoir displaced around 80,000 farmers and had a significant impact on the environment. By 1981, a smaller dam was built at the town of Kpong, downstream from Akosombo and further upgrades to Akosombo have become necessary for maintaining hydropower output. Despite a policy requiring that those displaced are enabled to at least regain their former living standards, a 1994 World Bank review cites few instances where this has occurred to even a small proportion of oustees . For Asokombo this is unfortunately not the case. In terms of production and advantages for the country, the dam’s power production capabilities were initially significantly above power demand, but later on a rise in national power demand resulted also in doubling hydropower production. Increasing demands for power exceed today what can be provided by the current infrastructure. Power demands, along with unforeseen environmental trends like the ever lower lake levels, have resulted in rolling blackouts and major power outages. As Patrick McCully in his well known book "Silenced Rivers" reports, serious droughts have occurred in the country in 1982-1983 and in the mid 1990s, leaving population to suffer from long blackouts. He criticizes therefore the heavy dependence of Ghana, as well as other countries, on few large projects. 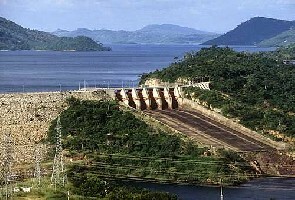 Project Details The Akosombo Dam was called "the largest single investment in the economic development plans of Ghana." Its original electrical output was 912 megawatts, which was upgraded to 1,020 megawatts (for comparison, the power of a large nuclear reactor) in a retrofit project that was completed in 2006. Relevant government actors All ministers were somehow involved, as Asokombo is the major hydroelectric project in the country. Other The physical health of local communities has been diminished from this loss of shellfish populations, as they provided an essential source of dietary protein. The actual presence of aquatic weed along the lake and within the tributaries has resulted in even greater detriment to local human health. The weeds provide the necessary habitat for black-fly, mosquitoes and snails, which are the vectors of water-borne illnesses such as bilharzia, river blindness and malaria, but also HIV and schistosomiasis. Why? Explain briefly. After so many decades since its construction, Asokombo is an worldwide relevant example of how resettlement programs of whatever kind for such mega-projects are just not viable and have in fact never worked. Increase in diseases, plus health and environmental vulnerability of the area speak for itself. The electricity has been large for export in the form of aluminum.